﻿﻿Let's create something beautiful. Together. We are an importer and fabricator of stone products such as granite, marble, travertine, limestone, quartzite, soapstone, slate and Quartz. Our services include kitchen countertops, islands, bars, vanities, fireplaces, Jacuzzis, bathrooms and more. You may be looking for a creative new look for your kitchen, and considering installing new granite counter tops. Or maybe you'd love to wow your friends with a rustic designed patio during the summer. No matter the project, big or small, Litchfield Hills Marble & Granite brings unique inspiration and creativity for an experience and results you will love. State of the Art fabrication technology enables us to handle any project regardless of size. Our fully compurterized equipment provides us the capacity to respond to all customers' specific needs with the highest precision and finest quality. With excellent craftsmanship we're able to complete projects within five days of template. We value our customers by providing them the highest quality products, good and honest workmanship, warranty, excellent client management, and reliable delivery. 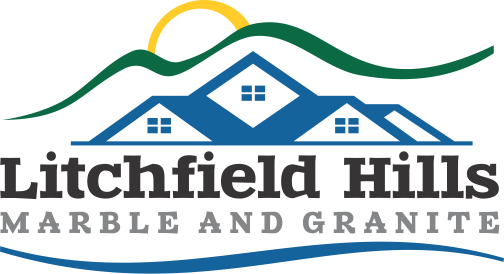 Litchfield Hills Marble and Granite provides a 20 year limited product warranty and is committed to 100% customer satisfaction. Look for our service in the Ridgefield, Wilton, Redding, Danbury and more in the tri-state area. We are with you every step of the way until you're satisfied. And get 10% OFF your next project!